When director Sam Raimi and actor Tobey Maguire swung into movie theaters on the backs of Sony's Spider-Man movie franchise, they broke records and set new standards for how 'comic movies' should be done. 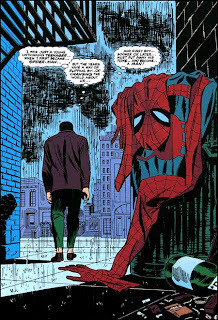 Today however that swing has swung, with news Sony will reboot the line, swapping Spider-Man 4 for a high school based revamp, focussing on Peter Parker as a "teenager grappling with both contemporary human problems and amazing super-human crises". While it does sound like a return to 'classic Spidey', chucking money-makers Raimi and Maguire is a ballsy move for hopefully what will be more than Harry Potter with webs. The 'all new - all different' Spider-Man, based upon a James Vanderbilt script, is set to start production in the next few weeks from Columbia Pictures and Marvel Studios, for a summer 2012 release. This seems like they're following the Batman and James Bond mold. I think they realized the last film was--less than stellar, let's say--and at this point Raimi and Maguire's paychecks must have been ENORMOUS. I wonder if they will get a new lead actor? It could be hard trying to reverse the aging process of the actors from the previous movies. There have got to be some super talented younger actors wiating for a break through part. Thanks for the posts guys! Yip - a new lead actor is going to be part of the search Jonny, but like you say I'm sure there will be no shortage of contenders, that is is Sony don't already have someone in mind. As for the last film Rob, yeah that definitely didn't help things. But new start - new hope - for Venom, Sandman and perhaps even a new Green Goblin - this time one whose face can move!